Brussel sprouts get a bad rap for a good reason. Most of us remember bitter, soggy, mushy, pale “bounce-able” balls rolling around our plates. Well, not this time. 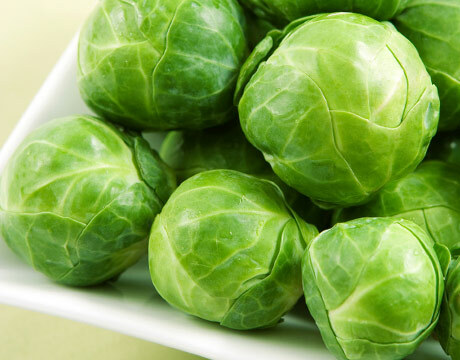 This recipe for brussel sprouts is sure to redeem their reputation wit ha sweet savory balance that features a Maple Flavored Pancake Syrup (made by Walden Farms) that has zero calories, sugar and fat. Too good to be true? Heat oil in a non-stick skillet over medium heat until the oil is shiny. Carefully place the sprouts, cut side down, and cook until brown (5-7 min) stirring occasionally. Stir in the shallots, 2 tbsp vinegar, syrup, thyme, salt, pepper and cayenne. The cayenne does not add any heat in this dish. It helps the brussel sprout bring out its own flavor. Reduce the heat to medium-low, cover, and cook until the sprouts are bright green and just tender, (6-8 min). Uncover, increase the heat to medium-high and cook until the liquid has evaporated (3-5 min)As soon as the liquid has evaporated, remove from the heat, stir in the remaining tsp of vinegar and butter substitute and serve. This entry was posted in Healthy Ideas, Holiday, Metabolic Medical Center Recipes, Modified Profast (Fast and Flexible) Recipes, Nutriplus Recipes (Balance Your Pyramid), Party & Entertaining, Vegetables and tagged apple cider vinager, brussel sprouts, maple syrup, Metabolic Medical Center Recipes, one dish, shallots, side dish, sugar free, Vegetable, vegetarian, walden farms by foodies4mmc. Bookmark the permalink.